I started losing my hair about 4 years ago. The hair loss was a slow progression. However, finding out what was causing the baldness took time and ultimately more hair loss. 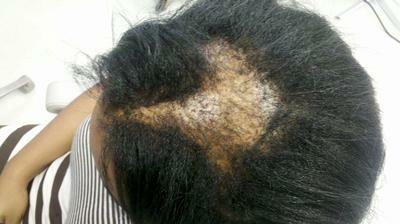 I was diagnosed with scarring alopecia. Although, I had no biopsy to confirm the diagnosis, my hair seems to have responded. My treatment plan included steroid injections into my scalp, along with topical triamcinolone 0.1% cream. I would like to know should I still get a biopsy and how do you know when hair transplant surgery should be attempted. Thanks for your dedication to this emotionally challenging disease. It' good to hear that you have had a positive response to the treatment that you mentioned. Additional treatment for this condition could include oral medications such as doxycycline or plaquenil for a 6 to 12 month period. If you are considering a hair transplant procedure as a way of restoring your hair, then it could still be of benefit to have a biopsy done. The main purpose of doing so would be to check and see if active inflammation is still present in the areas of hair loss. You would not want to have hair transplanted into the area if there is still inflammation present since this would damage the transplanted hair and lead to graft failure with no hair growth.